The ship De Luciana was built in 1916 in the Netherlands as a herring boat without engine. In 1928 the ship was sold to Sweden and sailed until well in the Seventies as a freight ship in the Scandinavian waters. Since 1982 it has been used as a sailing passenger ship with auxiliary motor. 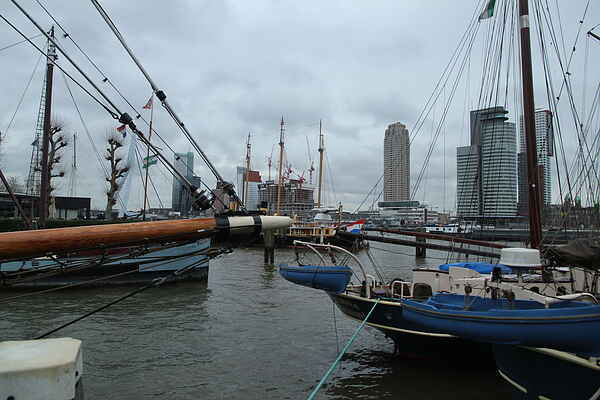 In winter the Luciana is moored in the Veerhaven in the heart of Rotterdam, at a stone's throw of the water taxi to hotel "New York". You will enjoy a fabulous view on the new Erasmus bridge and the "Kop van Zuid", sometimes called : "The Manhattan on the Meuse". It is also possible to go out sailing against additional payment there. Please contact the captain at least a week before you leave ! All in all, ideal for a fabulous stay in the inner city of Rotterdam... Duvets and pillows are part of the linen package which you can rent. You may bring your own sleeping bag or duvet and your own bed linen. A TV/DVD player can be provided on request.